At the Metropolitan Museum of Art in New York City, one of the paintings done in 1865 is entitled "Christmas Morning." In that painting, a young gentleman is shown entertaining his two sisters with a toy that looks very much like the dancing man that our toymaker calls a "limberjack." To play with the toy, you sit on the end of the paddle, putting your weight on just enough of it to keep spring in it when you brush the free end of the paddle with your finger. 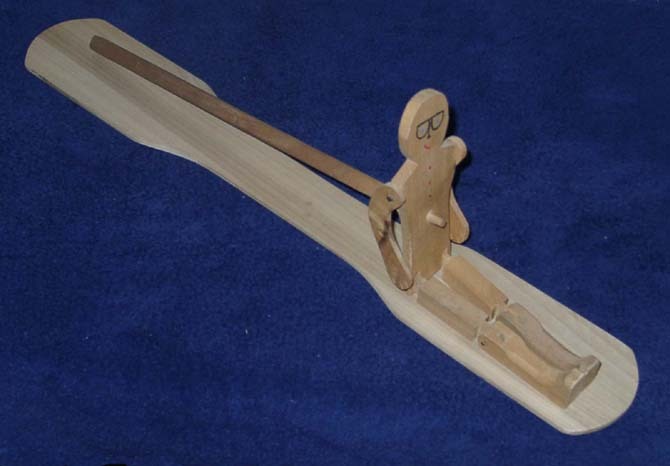 You then hold the dancing man (by the stick as shown in the picture) on the paddle so that his feet just barely touch it. He should be upright and not sitting like our picture shows. You then stroke down the edge of the paddle so it just smacks the bottom of the dancer's feet. This will cause him to do a "dance" on the paddle.